Day one of Artisan II course at the San Francisco Baking Institute, Frank our instructor touched on a buzz word for me - Freedom. This was by no means any where in the manual or was there any hint on his part of an emphasis when he mentioned it; it was a casual passing comment. 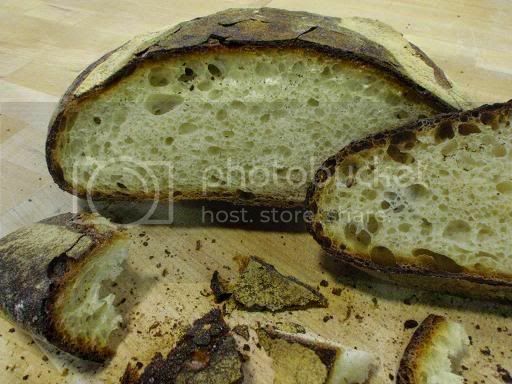 He said the best bread for him is a bread with a pre-ferment (poolish or sponge where there is a small amount of commercial yeast) and a levain (in the final dough which is then retarded), and that this combination gives you a lot of "freedom." There were 16 of us sitting in the classroom. Not everyone gets a message at the same level. I am not suggesting one level is higher than another, or a student who gets a particular message is a better baker than the rest of the class. I am saying - the message I received has a special meaning to me, and me only. For the rest of the day, I was chewing on the concept. I did not know what exactly in Frank's remarks that fascinated me - is it the excitement in the knowledge that the combination of a pre-ferment and a levain would give me the possibility of making a great flavored bread, or what? It was not until the next night when I was reading my French bread book (which I brought from home) with the assistance of Google translator on French bread tradition that it clicked on me - tradition? freedom? Is tradition a quantifier and qualifier, a boundary, a set of rules and conventions; or is tradition a liberator? Why did the best abstract artists in fine art history start their life-long pursuits by doing serious charcoal sketches and still-life drawings? I am a Chinese, but do I want to be bound by it? Freedom. My tradition is one enriching element in my fabric but I do not want it to be a boundary. I learn bread, but I do not want to be bound by the bread conventions. I will make breads that are meaningful to me, whatever that is. I answer to myself. As in any learning, formula can never replace the reasoning behind. The concept is always more valuable than the mere formula. Once we are able to extract the governing concept or principle from the formula, we have freedom to construct our own formula. The aspect of freedom excites me far more than the formula. But I have to start my learning from the formula. 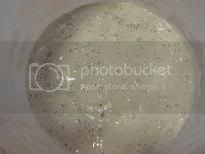 200 g starter, amount increased from 120 g to 200g as this would be used in the afternoon to make sourdough! Mix the above ingredients in a bucket (or a large bowl) by hand. Turn out the sticky mess onto the work bench. 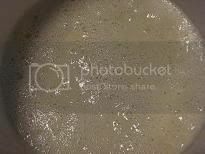 Use the palm of one hand, stretch out (like smearing) the sticky mess against the work bench for one minute, not any longer, to thoroughly hydrate the flour;. Scrape the sticky mess back into the bucket. With one hand holding the edge of the bucket, another hand stretches and folds the dough onto itself at one corner of the dough; then gives the bucket a 1/4 turn, and stretches and folds the dough again until you have done four corners (ie, one round); do two round in total, no more. At another 30 minutes mark, repeat step 6; at this point you will notice some strength in dough has developed. At another 30 minutes mark, repeat step 7. As some dough strength has developed, you will notice the dough is smooth and silky and easily clears the side of the bucket as you stretch and fold in the bucket. At another 30 minutes mark, turn out the dough onto a well floured work surface. Oil the bucket before you attend to the dough again. 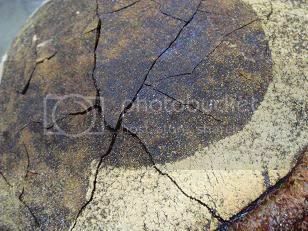 Now, pre-shape the somewhat loose dough (due to high hydration) into a boule by folding 1/4 of the dough onto itself until all the dough is onto itself, then flip it over; and with two hands on both sides of the dough, create surface tension by applying downward pressure against the work bench and form the dough into a boule. With the flexibility of a gymnast (joking), flip the pre-shaped boule into the bucket (right side in the bottom) in a swift motion. Dust your linen lined basket with rice flour or a mixture of bread flour and rice flour. At 15 minutes mark, turn out the pre-shaped dough onto a well floured work bench. Shape again as in step 10 but try to do it as tight as possible without tearing the skin. Flip the shaped dough into the basket, right side down. Cover. At 30 minutes mark, wheel (I mean, chuck) the dough into your fridge for overnight retardation (14 hours). At 8:00 am, remove the dough from the fridge to room temperature. 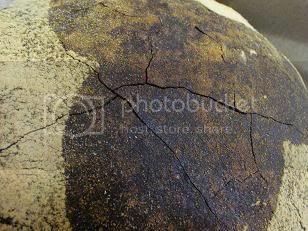 Crust: I cannot claim credit for the beautiful crust. Frank was our master baker, the man at the oven. He controlled the oven temp, the length of the baking, and all that cares that go with the baking. The crust is very crispy and full of that caramel/charcoal fragrance. 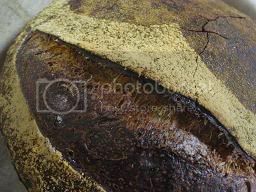 Crumb color: I have never seen such a beautiful crumb color. You would say there was hardly any oxidization of flour at all due to the way the dough was mixed and fermented, resulting in this exceedingly creamy, somewhat golden, color. The taste is a little bit sour. I am surprised as I would have thought with the liquid levain, there would be more lactic acidity, rather than acetic acidity. Maybe overnight retardation is the reason. 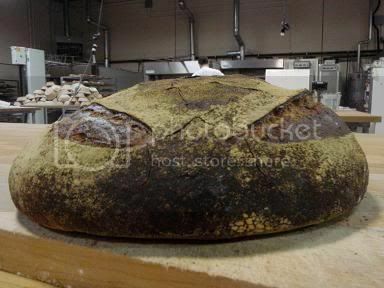 Or maybe any true San Francisco sourdough is sour... that San Francisco air and sea breeze? The mouth feel of the crumb is moist and mildly chewy, full of life. Before I leave San Francisco I have one more job to do - to "immortalize" my San Francisco starter to bring home to Australia in dry form. 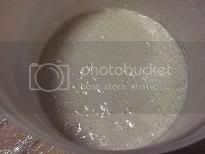 After using it to mix the dough at day 4 afternoon, I had about 460 g of liquid starter (100% hydration) left. 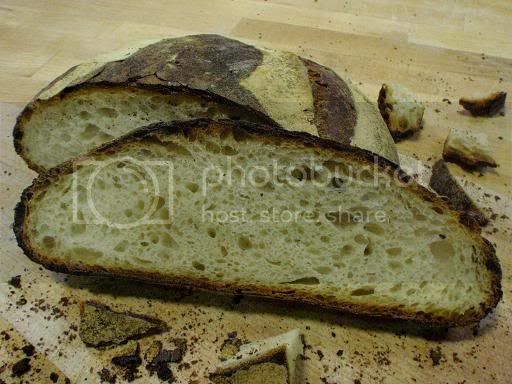 I turned it into a stiff starter (50% hydration) at the end of that day's class and this morning (day 5) I fed it again. When I finished today's class, it was already very bubbly. I brought it back to my hotel and was painting the starter onto a few parchment paper. Before I had done painting the 5th piece of paper, the first one partially dried. It was lucky that I turned the liquid starter into a stiff one as it dried faster; my decision was one of greed - I thought with a stiff starter, more flour, more beasties. 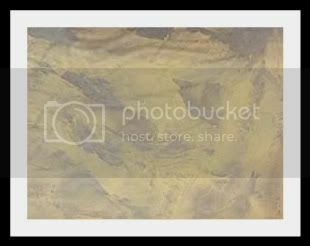 Here is my abstract starter painting with flour and water to finish the day. p.s. I asked Frank if I could blog today's sourdough. I never received a YES answer so quick. His reply was as if my question was unnecessary. Interesting post and lovely bread. I forgot a loaf in the oven the other day and it came out the same color as yours, looking a bit overdone, but it was EXCELLENT. Freedom in baking really comes from experience as well. It's easy to invent, to modify quantities, rising times accordingly, when you've made good friends with your starter and know how temperature, quantities of yeast and types of flour, kneading types and times are all going to play in the bread making process. I often make a levain bread with different flours and a small quantity of yeast. I play with the rising times using cold fermentation or not. It does indeed give you lots of freedom and you can make up your own breads, a different one every time if you like. It takes the stress out of following recipes and dealing with the disappontment that sometimes occurs when the bread doesn't look like the picture in the recipe book. There is no one GREAT bread. As you mentioned about traditions, I live in a country based on culinary tradition (France) but there is no ONE recipe for Pot au feu or Ratatouille. Each grand-mother, mother or person cooking had their own little modifications (mine with the latter is using only have the tomato!) and the dish is still traditional. Freedom in cooking and baking is my motto and also one of the reasons I can't post recipes very often on my blog. But it sure makes baking fun! It is so true that "there is no one GREAT bread;" nor is there one single way of making a good bread. I don't believe there is such a thing called universal tastes when it comes to bread, or food or wine for that matter. We are all ears when we come across different methods and ways of doing things, but we have our own personal preferences. And who knows, given a different time and space, our own tastes of preferences may be different too. Thank you for your comment. I follow your posts. I admire people with 5 kids and still bake actively. Another great post, Shiao-Ping. I'm glad to hear you enjoyed the class. the crumb looks awesome, but the crust looks burnt! You describe charcoal taste, that does not appeal to me. It's very poetically written, your posts, always esoteric. How fortunate you are to be able to travel and experience. Good for you! Enjoy! I have trouble with certain English words, for instance "charcoal." It's probably not a good choice of word, because the crust does not taste burned. What I meant to say was the crust "looks" charcoal color, not that it has a charcoal taste. But in any event I understand what you're saying. This sourdough was indeed a fully baked loaf. Since Frank was in charge of the bake, one must assume it's boldness was entirely intentional. This is more in the European style than the typical SF sourdough style. Having just spent a week with a ... challenging oven, I am envious. Looking forward to reading further reflections on your SFBI experience, Shiao-Ping..
You mean the "charcoal" looking crust? Yes, it was intentional. Total ingredients before mixing weight 1.5kg but after bake it was only 1.1 kg (there was some loss due to hand mixing - constantly washing hands and therefore some dough was washed off). I will try to record some key points from the course. ... and I am also looking forward to more stories from your SF experience. Shiao-ping! I have the luxury of cleaning up after you:) I'm at the SFBI taking the baguette course this weekend, and they had left the list of Artisan II attendees lying around on my table. I saw "Shiao-Ping" in the list and I went "Nah, she's in Australia, can't be the same!". So, did we say Hello? We did - now. We didn't meet, though:) I'm just back from the course now, and yes, Frank is an awesome instructor.. I so enjoyed your description of your experience at SFBI - it revived my feelings of adventure and discovery I experienced at KAF! Also it was very helpful of you to show the growth of a new starter in pictures as opposed to words only. 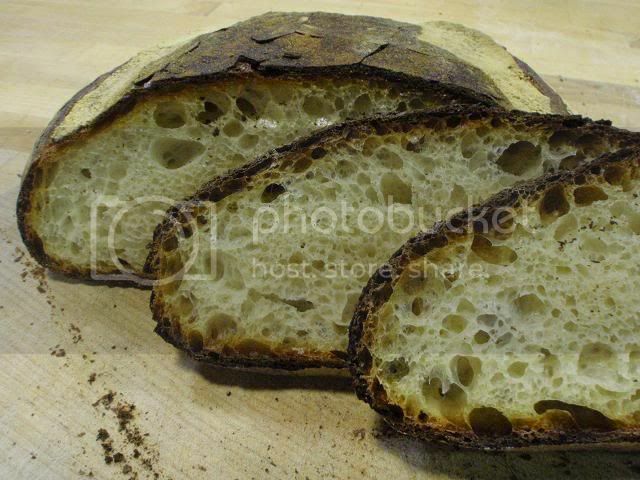 But most extraordinary are the pictures of your sourdough! The pattern, the slashes, and the wonderful looking crust (it calls to my mind chocolate not charcoal). Hamelman in his book speaks of the wonderful pumpernickels he learned to make that would slowly bake overnight, and I imagine a crust such as yours. "Chocolate not charcoal," thank you. Some one told me that out of all the courses he attended at SFBI, it was the first one, the Artisan I, that was most memorable to him - "adventure and discovery" as you said. I am a newbie and I find your writing superb. I have a few small questions that will no doubt celebrate my newbietitude when dealing with levain. When preparing the levain, do you keep the levain at room temperature? Do you keep it coverred and if so with what? What do you do with the reat of the levain, after making the first loaf? Can you feed it again? Welcome to TFL. (1) Yes, I do keep the levain at room temperature, from my own experience, any where from 15 - 29 C (60 - 85F). There may be textbook recommendation as to the best room temp range, but that's the range that works for me. 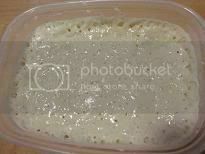 (3) Normally I cover the container with its own lid, or just plastic wrap. Even though they said wild yeast is every where in our living environment, but supposedly there is enough in the bread flour you use to mix with the water for the culture to grow. 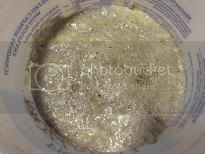 (3) For beginners, it's best to follow the rule to the letter (meaning to throw away the rest of the culture/starter that you don't use); but once you have a thriving starter going, what you are throwing away can be made into a sourdough bread! (4) If you feed the starter that you are supposed to throw away, you will end up with huge quantity of starter, you will have no room for storage, so it's best to use it up in bread, in pancake, in pizza... (the list can go on) if you are not throwing it away. Hope this answer your queries. 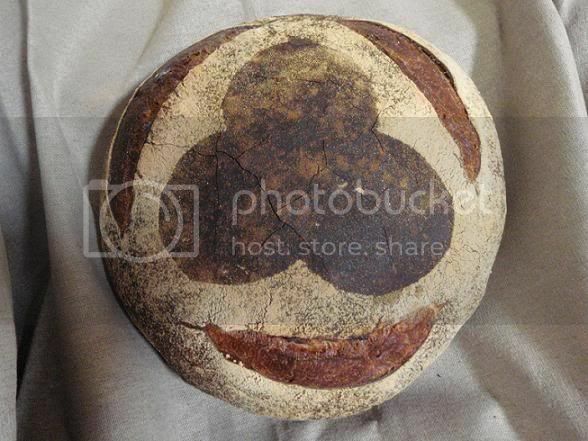 Shio-Ping, Thanks for sharing your bread baking Artisan II course with TFL! I hope you have fun with your new little SF beasties when you return home! 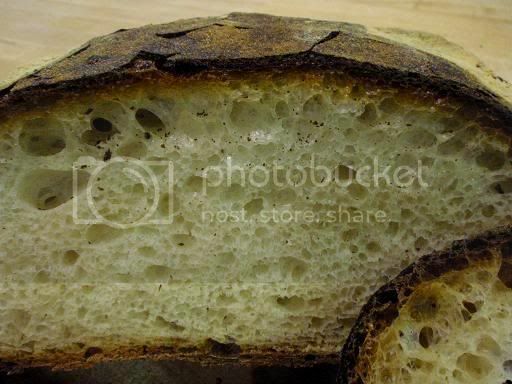 The crust on your loaf looks like many of the loaves that come from a little local bakery down the road from me that has a big woodfired oven out back of the shop. I enjoy so much to read your writing and see your pictures. I can't wait to try it myself. Question - After 30 minutes baking, you say that you bake it for another 30 minutes with the door open. I'll be grateful to have more details about it since I don't really understand: the oven is still heating? tuned to 450F? the door is wide open? do you leave the loaf on the stone? Thanks again for writing these posts! that was baking in the professional oven at San Francisco Baking Institute. The oven there is big and very deep; when the oven door is open (with the loaf still in its normal baking position, untouched), the moisture inside the oven is allowed to escape so as to make the crust more crispy. At home, what we do is, we keep the oven door ajar with a fork or spoon (something that is stainless steel). I'll try with a fork. Just to make sure - you keep the oven turned on or turn it off? (there are other instances where bakers turn the oven off with a fork to keep the oven door ajar). Sorry I missed all the classes, but Turkey was incredible! What happened to Artisan I, did I miss your blog on that class??? Welcome back to the West! I heard that Turkey is really exciting to visit. One day if I do my Chinese silk road trip, I might go there! No, I don't think you missed anything. I didn't post from Artisan I. On the last day of Artisan I, while I was doing something in the bread lab, you were already enjoying a glass of red with the other troopers; I don't think we said proper good-bye. MC came around for a drink before Artisan III started. My Penfolds red which I brought with me from Australia was confiscated in L.A. airport; just as well she is more a white person than a red. I love your post about a fermented story, I wonder if it is an advantage or disadvantage to be able to get a sourdough starter going in just one day; and I always thought kimchee was a Korean specialty; obviously I was wrong. You've really got plenty of interesting stuff going on at stir the pots.